The ACT currently has about half a dozen armed bowlers. It is difficult for those players to connect with each other and arrange to enter tournaments, armed or otherwise, as a team. 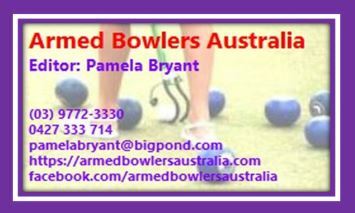 If you are an armed bowler in the ACT please email me pamelabryant@bigpond.com and I will try to connect you as a group. Similarly if you are aware of any armed bowlers at your ACT club please pass on this message to them.